Take a peep into the tattoo pictured above. Did you recall something? Yups pages of Dr. Suess book! Anything that lets us relive our childhood is certainly each one of us would fancy. 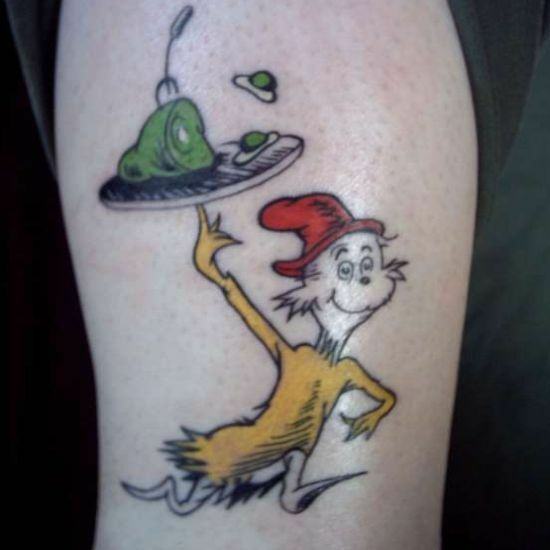 And Seuss-themed tattoo can be a perfect delight. Iâm sure this tattoo made youâll revive your childhood days. Hey guys, it can be a perfect tribute to your kids too! Reason for getting this cute Green Eggs and Ham tat could be different but the result would always be same for all-Awesome!